First, it’s quick-cooking, golden-seared scallops. I like sea scallops from the East Coast (we use those amazing Viking Village scallops at Frontera and Topolobampo) or the ones from Magdalena Bay in Baja (they’re on the menu at Xoco most of the time). Then it’s tangy-bright tomatillos, briney olives, and smokey bacon coming together like a great jazz trio. And finally it’s a good bottle of wine; Jill Gubesch, Frontera’s acclaimed sommelier, puts you on the insider’s track. One final note from the chef: the best scallops are seared in a hot-hot heavy skillet (I like seasoned cast iron the best, but a heavy stainless steel works well too). Heat the dry skillet over medium-high. Dry the scallops on paper towels. When the skillet’s thoroughly heated, film it with oil or other fat and lay in the scallops in a single layer. Don’t touch them until they’re crusty-brown underneath. Only then should you carefully lift them with a spatula and turn them to brown the other side. White: I love to pair dry Rieslings with this dish. They have wonderful acidity to match the tangy tomatillo, and the mineral finish highlights the herbs while balancing the briny olives. 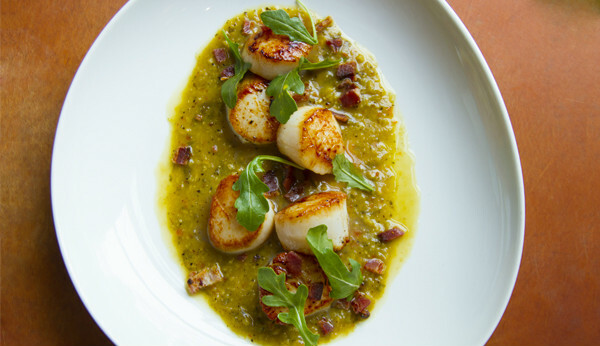 Red: I would pair a softer, lighter style Syrah to bring out the natural sweetness of the scallops and match the fruity flavors of the roasted tomatillo. Prepare the tomatillo base. Roast the tomatillos and chiles on a rimmed baking sheet 4 inches below a very hot broiler, until blotchy black and soft (the tomatillos will turn from lime green to olive), about 5 minutes. Flip everything over and roast the other side. Cool, then transfer to a blender or food processor, including all the delicious juice the tomatillos have exuded during roasting. Pulse a few times, then add the white wine and olives and process to a coarse puree. Finish the sauce. Heat the oil in a large (4-quart) saucepan over medium high. Once hot, add the garlic and stir until golden brown, about 1 minute. Scrape in the tomatillo sauce and cook until the mixture has reduced to the consistency of thick tomato sauce, about 4 minutes. Reduce the heat to medium and add the epazote, cilantro and broth and simmer for 15 to 20 minutes until the consistency is like a light cream sauce. Taste and season with salt, usually 1 teaspoon depending on the saltiness of the broth. Keep warm until you’re ready to serve. Cook the bacon. While the sauce is simmering, heat a very large (12-inch) heavy skillet (preferably cast iron) over medium-high. Add the bacon and cook until crispy and browned, about 10 minutes. Scoop out the bacon (leaving the bacon drippings behind) and drain on paper towels. Sear the scallops. Heat the skillet with the bacon drippings over medium-high heat. Pat the scallops dry with a paper towel and season both sides with salt. When the pan is very hot, lay in the scallops. Saute until golden brown, about 2 to 3 minutes per side, or until medium rare. Transfer the scallops to a warm plate. Finish the dish. In a small bowl, toss the arugula with the lime juice and sprinkle with salt. Ladle the warm tomatillo-olive sauce on the bottom of each of 4 warm dinner plates. Place three scallops on each plate and top with some of the dressed arugula. Sprinkle with bacon. You’re ready to serve.